Matte finished link, stainless steel stretchable Italian charm bracelets for modular jewelry. 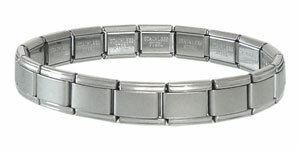 Compatible with other 9 mm standard size Italian charm bracelets, such as Nomination jewelry and Zoppini charm jewelry. This bracelets are sold by dozen (1 package of bracelets = 12 pieces of bracelets).